“The Well of Ascension” is where the Lord Ruler gained godlike powers to battle the Deepness and then transform the world instead of just releasing it, or that’s what Kelsier’s crew believed throughout the second Mistborn book by Brandon Sanderson. The middle volume of the Mistborn trilogy not only has the magic of allomancy of the first but realpolitik as the Final Empire collapses into numerous kingdoms. The book begins a year after the Collapse following the death of the Lord Ruler with more point-of-view characters from the beginning than “Final Empire” had initially, giving a sense of the bigger scope that “Ascension” is meant to have given the plot threads throughout the book. The primary character continues to be the street urchin-turned-Mistborn Vin who not only protects the city from antagonistic allomancers bent on assassinating Elend Venture who rules Luthadel as King and who wants to marry her. Elend along with Vin and the rest of the Kelsier crew must deal with three armies arriving and besieging the former imperial capital as well as dealing with internal political intrigue. And only to add stuff on top of that, the ever present nightly mist is starting to crept into the day, form spirits, and kill people. At about 760 pages, “Ascension” is a 100 pages longer than “Final Empire” and given the intrapersonal, interpersonal, and political conflicts within the book this seems a reasonable. Unfortunately there were brief stretches in which the writing drags in the middle and last third of the book as internal conflicts are rehashed once again for Vin and Elend in regards to themselves and the other, the sheer amount of times it’s repeat gets wearing to the reader. The book has a lot of unforeseen twists that catches the reader off guard both positively and negatively depending on the clues only picked up on after the fact, if there are any. However unlike the “Final Empire” in which the last 100 pages turned out to be a weakness, the last 100 pages of Ascension was a strength as subplots were resolved and the story threads quickly interwove for quiet a interesting ending that makes you want to see what happens next in “Hero of Ages”. As with all second acts, all doesn’t go well for the heroes even though they survive (for the most part) and strive to build a better world than the one they’ve had. “The Well of Ascension” builds upon what Brandon Sanderson began in “Final Empire” not only in the present time frame of his world, but into it’s past and setting up a potentially fantastic ending to the “Mistborn” trilogy. The use of authentic professional law enforcement and legal experience creates a realistic fiction in “Facing Justice” by wife-husband authors Diane & David Munson. With the tagline of international terrorism comes to church, a significant Christian imprint appears throughout the book in numerous character’s story arcs. The plot centers around the capture of a Bin-Ladin like terrorist leader through the use of informants starting in a raid related to money laundering, the use of real life investigative techniques both domestic and foreign help the book throughout. The major secondary plot revolves around a young anti-terrorism agent bending the rules in the pursuit of supposed terrorist contributor, who happens to be the husband of a member of the main character’s church. The point-of-view switches through numerous characters allowing the story to be seen from different angles giving the reader a clearer picture of the entire course of events. While the overall story and the significant subplots are very good and keep the reader engaged, the introduction of new point-of-view characters just when they’re needed in the book seemed a bit too much when earlier point-of-views from the characters would have added some development and making their later importance to the plot more welcome. The book has Christianity prominent throughout numerous character’s lives in some form or fashion, while this is not a negative in and of itself, the sheer amount and heavy-handed nature of it even made a Christian like myself think enough. After finishing “Facing Justice”, I thought it was a good first outing by the authors and made me curious to see what would happen the second book of the series both in plot and quality. This is the second time I’ve read Harry Potter and the Order of the Phoenix, but the first since finishing Deathly Hallows and first time reading it critically. I’ve tailored this review in the following in mind: the intended audience for the book (much younger than myself) and its place in the series. Order of the Phoenix is the longest book of the series and Rowlings continued expounding upon numerous details and backstory that had started in Goblet of Fire. With maturing plot and content Rowlings continued her brilliant wording which allowed her to give various their due. The use of propaganda by government through both overt and subversive is one of the central themes of the book, notably connected to one of the most loathed characters of the entire series, Dolores Umbridge. Beyond following Harry’s ‘worst’ year at Hogwarts while dealing with not being believed about Voldemort’s return and then wondering why Dumbledore doesn’t want to deal with him. Rowlings continued to develop her established characters through experiences and attempted teenage relationships that both added to and (unfortunately) took away from the whole narrative. Order of the Phoenix sees the next phase of the series’ overall story as the Wizarding World must be convinced that Voldemort had returned and preparations must be made to counter his attempt to take power. The transition the “lightness” of the series to darker themes is really pushed to the forefront from and unexpected source, the Ministry of Magic. The Ministry, really Cornelius Fudge, along with the Daily Prophet attacks the creditability of Dumbledore and Harry to the Wizarding World at large then in Hogwarts itself. Harry’s time in Muggle world grows shorter to allow him to be immersed in a now somewhat hostile darkening Wizarding that he can’t believe that Voldemort hasn’t returned. Important characters, important magical objects, and other important facts are sprinkled into the narrative even before Harry’s return to Hogwarts but the astute reader will notice their importance as events unfold though unfortunately plot hole resolutions are less satisfyingly written than in previous volumes. The “innocence” of the previous books is completely gone and situations that occur were eerily repeated years later in the real world in a fashion. Order of the Phoenix is where Harry’s story darkness as Voldemort shadows his thoughts (literally) while dealing with classwork that effect his future and teenage hormones and attempting to find some good in his life. However Harry’s anger that lasts throughout the book does become a bit much, even though it seems to start out as a possible symptom to PTSD, does get a bit much and in the end seems to just be a plot device that places a part in the Department of Mysteries plot. Harry Potter and the Order of the Phoenix is the first truly thoroughly “dark” book of the series, though it is just a shadow of how dark the series will become while telegraphing future events. Rowlings continued to keep the pace of the book going even as she expanded on several story arcs of various characters and added the normal teenage social travails that finally showed up, though somewhat a little late. Unlike Goblet of Fire, Rowlings took her time to add these new additions to create a better reading experience making this slightly better than. While the longest of the series and have elements that are a bit tiring, Order of the Phoenix is a good read. The Lancre coven return home in time for Magrat Garlick’s wedding, which is a surprise to her, and to find certain Lords and Ladies wanting to crash the event. Terry Pratchett returns to Discworld as the witches face off with faeries trying to make their way back into reality as Magrat tries to figure out how to be a Queen after finding her career as witch not going well while Granny Weatherwax and Nanny Ogg just continue on with their witchy ways. Having found the previous two witches books (Wyrd Sisters and Witches Abroad) not particularly to my liking compared to other Discworld installments, I was a bit hesitant when starting this book however that changed as Pratchett’s story unfolded. Following not only the perspectives of the three witches but also Magrat’s betrothed King Verence, two of Nanny’s sons Jason and Shawn, and numerous wizards from the Unseen University. The use of magical quantum mechanics is better explained than “mirror magic” in Witches Abroad and feels like it is worked into the plot easier throughout the book. The main antagonist once against has a history with Granny, but this time the Faerie Queen and her minions just come off as more real than other antagonists the witches have faced. But the biggest thing that made this book better than the previous witches books was the character development of Magrat, who instead of seemingly remaining flat came into her own as the Fair Folk attached Lancre to be a real Queen. The humor and engaging story of Lords and Ladies makes this one of the best Discworld books that I’ve read and major improvement over both Wyrd Sisters and Witches Abroad. If future Witches books by Pratchett are up to the standards of Lords and Ladies then I can’t wait to read them. 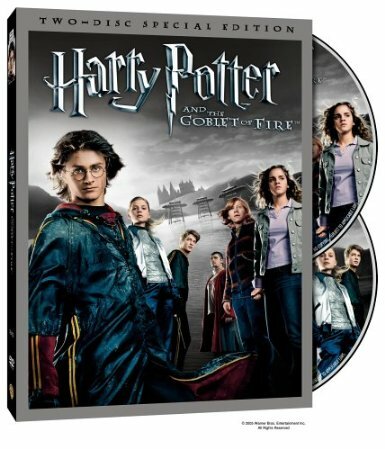 The film adaptation of Harry Potter and the Goblet of Fire, the fourth in the franchise, had both the unenviable task of following the “Prisoner of Azkaban” as well as bring to film how the series transitions from the lightheartedness of the earlier series to the darker themes to come. Like it’s predecessor, “Goblet of Fire” was boiled down to the essential plot and foreshadowing elements needed for future films, however until like it’s predecessor it wasn’t as well done given the amount of things that occurred in the book that related to one another. The decision to focus on action given the events of the Triwizard Tournament is not the problem, it was the amount and quality that was and that took away from the narrative especially when it came to Voldemort’s supporter within Hogwarts and the surrounding details connected to him. The memories of the Pensieve are better executed in the film than in the book, though the clues they provide could be lost if you aren’t paying attention. The main cast of the film continued to grow as actors and the inclusion of Ralph Fiennes (Lord Vordemort) and Brendan Gleeson (‘Mad Eye’ Alastor Moody) provide perfect actors to portray their characters. The fourth installment of the Harry Potter franchise is a good film, but there were missteps that stopped if from equally the quality of it’s predecessor “Prisoner of Azkaban”. Even with these unfortunate mistakes, “Goblet of Fire” does succeed in bring to the forefront that the franchise is in for some dark times ahead. The “Mistborn” are suppose to be of noble birth, however in Brandon Sanderson’s first book of the series of the same name it turns out this is not the case and it proves to be the undoing to the evil seemingly immortal Lord Ruler in the end. The first book of the “Mistborn” finds both tropes and fantasy genre clichés used in familiar as well as twisted ways, resulting in a excellent read. The plot followed two individuals, both the titular mistborn: Vin, a young thief just trying to survive, and Kelsier, the master thief who survived a living death sentence and plans to topple the Final Empire by starting an actual skaa (think serfs) rebellion. Set in a world where the hero failed a 1000 years before and the evil dark lord has ruled ever since, Kelsier brings Vin who doesn’t know she’s a mistborn into his high-end thieving crew with a plan to destabilize and topple the Final Empire. Giving “Mistborn” its major fantasy element is Sanderson’s inventive magic system of Allomancy, which individuals “burn” metals they have ingested that affect either internally or externally things specific to those metals. The titular mistborn have the ability to burn all known metals while mistings are only able to burn one metal, nearly all of Kelsier’s crew use allomancy in one form or another which is how Vin trains in the uses of her mistborn powers. For almost 550 pages, Sanderson writes a in riveting cannot put the book down style that keeps on raising the reader’s anticipating to see how he ends the story. Unfortunately the last 100 pages prove to be the weakest part of the book as Sanderson ties up all the various story elements he’s laid down. It isn’t the fact Sanderson ties it up, it’s how he does it. It almost felt like several things happening on top of one another that kept on pushing down the big showdown that you knew was coming and then didn’t give enough time for a proper denouement, which got regulated to the epilogue. However the decision to have the Lord Ruler appear only in the last tenth of the book and the bait-and-switch of his true identity was a pleasant surprise. “Mistborn: The Final Empire” is a satisfying read even with a unfortunate weak end but not even not to make you want to find out what happens next in the aftermath in the Final Empire’s fall.